My husband introduced me to the food from his native state of Andhra Pradesh when we were dating. The cuisine and its cooking style was a revelation for me. For instance, a simple sookha aloo-pyaaz or dry potato-onion dish tasted completely different because of the cooking process, the treatment of ingredients and a slightly different spice mix. In my North Indian home, we would have sputtered whole cumin in hot oil, added the onions, then the boiled potatoes along with some turmeric, a pinch of cumin-coriander powder and some dried mango powder called amchur. All of this happened in one pan and in sequential steps. My husband on the other hand cooked his aloo-pyaaz in three almost-parallel parts: onions fried first and made into a wet paste, whole spices roasted separately and ground into a dry spice mix, boiled potatoes stir-fried on their own until golden. The spices he roasted also included lentils like chana dal and urad dal, that were a completely new and surprise addition to my spice palate. Finally all three parts were combined into the dish called Bangala Dumpa Ulli Karam or Potatoes in Onion Masala. The resulting dish, earthy and hearty, had a strong taste of onion paste and freshly ground spices, and could be very spicy from ground dried red chillies. We now make it without any chillies so that two year-old Agastya, who loves onions and aloo, can eat it too. 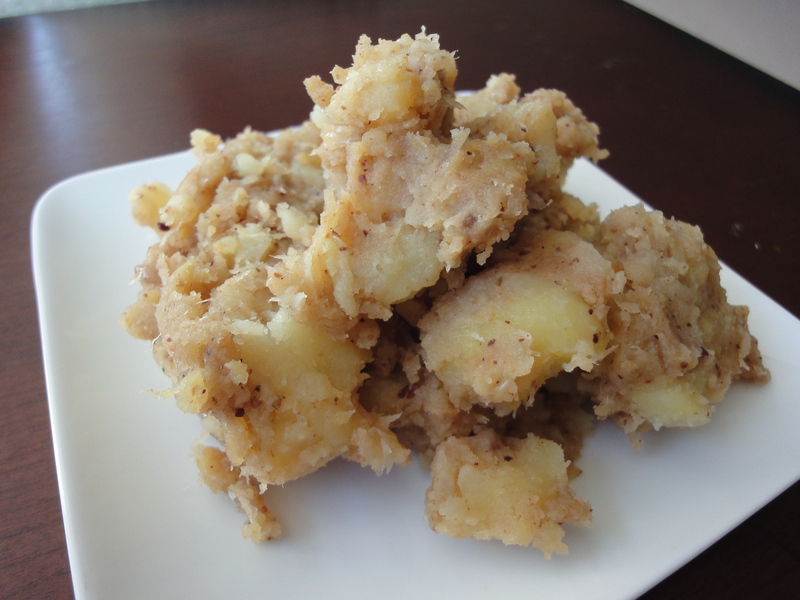 2-3 medium-sized potatoes, boiled and cubed into 1/2” chunks. 1. Heat the oil in a pan and fry the onions until light brown. Grind to a paste with a little salt. 2. In a little bit of ghee, dry roast the chana dal, urad dal, cumin seeds, mustard seeds and red chillies (in this order) until a fragrant smell is released, taking care to not over-darken or burn the lentils and spices. In a dry grinder or coffee grinder, coarsely grind the spices. Add this dry spice mixture to the ground onion paste and mix well. 3. Heat a little oil in a pan. Add the cubed potatoes and fry for a few minutes until golden. Stir in the onion masala and salt to taste. Cook on the flame for a couple of minutes. Serve hot with basmati rice or rotis.